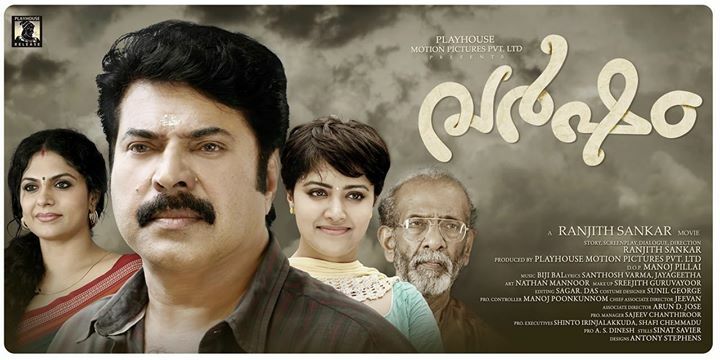 Varsham is the latest malayalam film of mega star Mammootty. Varsham movie releasing on 6th November 2014 all over. Varsham is written and directed by Ranjith Sankar. This is his first movie with Mammootty. Ranjith Sankar started his film career with the movie Passenger. Arjunan Saakshi, Molly Aunty Rocks, Punyalan Agarbathis are the other films by Renjith Shankar. Playhouse Motion Pictures is producing the movie Varsham. Mammootty , Asha Sarath , Mamtha Mohandas , Govind Padmasoorya are the actors and actress of the movie Varsham. Varsham will be the next release of Mammootty. Manglish, Munnariyippu, Rajadhi Raja are the other recent releases of Mammootty.